‘I FIND it hard to imagine Woking without him’ were the moving words of the Council Leader after Honorary Freeman of the Borough, David Robinson MBE, died on December 20, aged 83. The keen sportsman and family man was a devoted member of the community and accumulated an outstanding list of achievements. 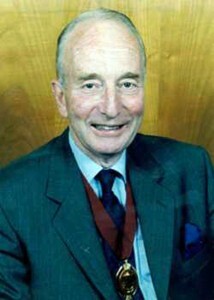 He served on Woking Council for many years and, in 1973, became the last Chairman of what was Woking Urban District Council. As such, he had the honour of collecting the Royal Charter Parchment Scroll & Seal from the Houses of Parliament in London when Woking was given borough status in 1974. He was Trustee of the Surrey Army Cadet Force and of The Queen’s Royal Surrey Regimental Association, as well as President of Woking Scouts for 20 years. He was also given the very rare promotion of Officer of the Order of St John for his work with the volunteer ambulance service. Unsurprisingly, he was recognised nationally with the honour of being made a Member of the Order of the British Empire. David married wife Joy in 1958 and they had three sons and a daughter. The couple celebrated their golden wedding anniversary in 2008, and have a number of grandchildren. Freeman of the Borough – the highest honour a local authority can confer on an individual. Woking Mayor Derek McCrum sent a letter of condolence to the family on behalf of the Borough Council, which said how David be sadly missed by everyone who knew him. A member of the Woking Conservative Association, fellow supporters also passed on their condolences, saying: “Although not an overtly political man and someone who fought staunchly for Woking as a town and for all the people who live and work here, David was a member of our organisation for some 65 years. His vision of the town thrust Woking into the second half of the 20th century and beyond. “David’s widespread involvement in local organisations is testament to his selfless donation of time and effort to helping others. He was also a most generous and convivial member of our association, respected and liked by all. Having achieved rank of Major in The Queen’s Royal Regiment, he later took over the family business of Robinson’s department stores. He joined Woking Chamber of Commerce and in 2009, members threw a dinner to celebrate 50 years of his devoted, selfless service, making him a formal Honorary Life Member. Council Leader John Kingsbury, who had known David’s for many years, shared a personal message with the News & Mail. He said: “We first met back in the 1950s when I joined Woking Young Conservatives and he was Chairman. “When I returned from National Service, he was in a much more senior position in local politics. Through David, who held senior rank in the Territorial Army, I renewed my own interest in the military and also became a committee member of the Surrey Army Benevolent Fund. “All my adult life I have followed his career and political and civic roles with ever-increasing admiration. I always looked upon David as ‘Mr Woking’, bearing in mind his considerable interests not only in the business community, but in so many charities, in particular the Red Cross. David’s family would appreciate if people avoided contacting them during this difficult time. Cards or messages can be sent by post.